I've been busy working on some of my papier mache items this week. As Papier mache takes ages to dry between layers I always have lots of things on the go at the same time. 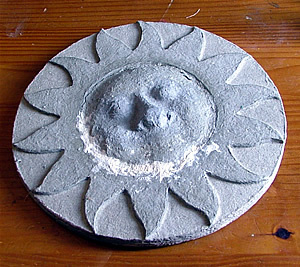 Here are two of the sun plaques in different stages of completion. The one on the right is a variation on the sun theme that I'm experimenting with. 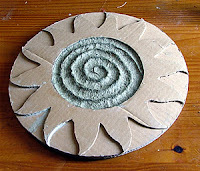 These are made out of corrugated cardboard with paper pulp applied directly over the top. I have several of these that I'm working on. Here are two of my cats that I haven't worked on for some time. I'm not sure how to finish them at the moment. I have had a few comments that they looks good as they are. I'm now toying with the idea of giving them a weathered stone finish. Do let me know what you think any ideas will be appreciated. I have almost finished the blue vase it just needs a couple more coats of varnish. Hope you like these examples of my work. I have some other projects on the go that I will post about soon. Nice job on the cats. How did you get them so smooth? Did you put something on top of the papier mache? If so, what did you use? I'm an art teacher doing papier mache with my students. We've done them before, but they always look pretty lumpy. I've been thinking about putting some kind of top coat on them but am not sure what to use. I think plaster would be too heavy. Maybe something like joint compound, but I have some concerns about the dust and health issues. Getting them really smooth is a matter of using a really fine pulp and sanding them down but it is dusty. I wear a mask and goggles when sanding. 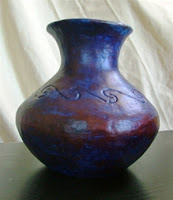 To finish off I use a type of gesso mix which I'm still experimenting with. 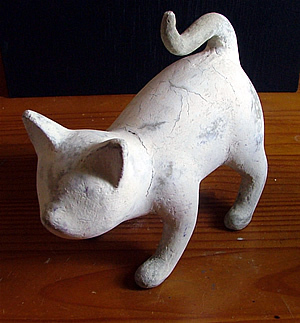 For the cats I used a polyfilla and PVA mix to fill in any cracks or really lumpy bits, then sanded until smooth. It is really dusty though so not a great idea for young children. I'm working on some experimental pieces right now on how to get different textures. I'll be doing a blog post about it in a few weeks when the pieces are finished. The easiest way to get a smoother finish is to use a fine pulp. 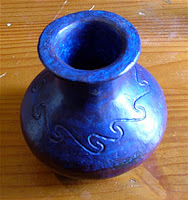 I'll be writing a tutorial on my website about this soon. So you don't have to wait here's a few tips. Tear approx 8 sheets of newspaper into small squares and soak it in a bucket half full of warm water for a couple of hours. Keep the soaked paper in the bucket with the water. Use a kitchen blender, the hand held type to break the paper down further. You will need to check the blade doesn't get clogged every now again so this must be done by a responsible adult. There should be no big bits of paper, the water should look cloudy. Strain the paper through some fine gauze, use your hands to squeeze out any excess water leaving the pulp just a little wet. Add 2tbsp filler, this can be flour or ground chalk, flour based pulp will go moldy if it's not dried quickly but you can use some clove or wintergreen oil to help prolong it's life. Add 2tbsp of glue, I use PVA, but any white glue will do. Add a tbsp of linseed oil and mix together. Once it's all mixed sprinkle 2 tbsp of wall paper paste and mix again. If you are working with young children who may try to eat the pulp do not add the wallpaper paste. Most wallpaper pastes contain fungicide which is toxic if swallowed. If the pulp is not sticky enough add more flour or white glue. I hope that helps if you have any more questions you can contact me through my blog or my website.